The product review for tonight beginner training call can be found here. “I really love instant milk for drinking; it is a lot like skim milk. I love having it on hand so I don’t have to run to the store for a gallon of milk. I love know that I am storing milk that my family especially my kids will drink. Here is a little comparison about the differences in milk products. Cooking and baking is its best use. You can add it to your recipe dry and just add the appropriate water. It can be used to drink. If you are going to drink it try adding a little sugar and a little vanilla, and be sure to drink it COLD! Drinking. If you make it up with cold water it is great to drink. Very similar to skim milk. I serve it a lot at parties and it is always a big hit. (once I convince them to drink it). Can be used for baking any other milk use. I prefer to reconstitute it and then add it to recipes as I would fresh. 1. 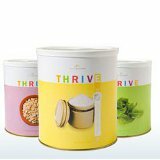 Thrive Instant Milk Whipped Topping: I know I talk about this all the time but have you tried it? It is amazing. I love making whipped topping from my powdered milk. The whipped topping ends up like cool whip or dream whip. Love it. 2. Strawberry Cheesecake Ice Cream: Really do I need to say more? 2. Magic Mix: I have been making magic mix for year and I love it, (I especially love to make it with powdered butter because it is than shelf stable.) If you are new to magic mix it is white sauce mix that you make using powdered milk (not instant) that you can than make into white sauce, gravy, cream of anything soup, pudding etc. Blogs--Should I write one? What do I need to know to decide? I recently had a consultant ask me if I had any advice about starting a blog to advertise her Shelf Reliance Business. As I wrote back to her I found that yes, I do have quite a lot to say about it. 1. Think it through before you start a blog. Blogs are time consuming, do you have the time to devote to having a successful blog. Do you have something to say that isn't already being said? I find blogs that are original and are content driven are the most successful. 2. There are a slew of blogs out there right now being written by SR consultants most of them are solely a marketing piece. Focusing on "buy from me." I think that these types of blogs will have limited success. The successful blogs will be ones with original interesting helpful content. So as you are thinking about what kind of blog you would like to have think of what content you can add to what is out there already. 3. Think about the platform of your blog: My blog is hosted on my own website. Notice it is www.cookingwithmyfoodstorage.com. I did not start that way I originally had a blogspot address. If I was doing it again I would start with my own domain name. My blog is a blogger blog. But I think if I was doing it again I would use wordpress. I did look into both before I started and I chose blogger because it is easy to use. But now I wish I had taken the time to learn wordpress because you have so much more control over the layout, format, etc. 4. Blogging is a long term strategy. I do think it is a good strategy but it is slow going at first. It took me months before I had anyone reading my blog, and months more before I had a purchase from my blog. 5. Before you launch your blog have some content. I recommend having 12 to 15 good posts up before you start marketing your blog at all. 7. I don't worry about SEO although I know a LOT of bloggers are obsessed with it. I blog to share my content and since I think I have good content I think people who are interested in it find it and share it. 8. Think about how often you are going to try to push people to your online store. Many of the SR consultant blogs are very heavy handed in pushing people to purchase through them. Personally I don't like this approach. 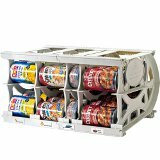 I do post about Shelf Reliance and its products but I try to be selective about how often. 9. Decided from the start that you are going to be an ethical blogger. I define this as: disclosing that you are a SR consultant, being honest in your opinions of products, and not doing anything sneaky to your readers (like linkbaiting, hiding cookies, or anything else sneaky). I have found that doing these things drives traffic AWAY from your site. I know which blogs I read do these things and I won't link to them. The bottom line is they decrease your readership and have little impact on sales. Good content = more readers, more readers = sales. Don't be seduced by the dark side. It is VERY tempting. I know I have been tempted too. …What made the difference in advancing at each level? What do you do differently at a Silver Executive that you didn't do as a consultant or mentor? I have been thinking a lot about it. I think the question comes in two parts so I’ll answer them separately. 1. What has made the difference in advancing at each rank? Consultant to Mentor: for me the key to this rank advancement was signing up my first consultant. It is not necessary to have any consults under you in order to advance in fact I would like to encourage you to try to hit mentor in your first month of parties (the first month you are actively doing parties for the entire month). To hit mentor by yourself you need $3,000 in sales. That is about average 4 parties, I find that consultants who start big have awesome parties. If that is your plan don’t wait for parties to come to you find 4-6 parties or how every many you want to do and get them scheduled. Mentor to Director: for me the key to this rank advancement was attending Shelf Reliance Convention. I attended convention just after I hit the rank of mentor. It was a HUGE help. But you are thinking “I am a mentor now and convention isn’t tell next spring” You can still access I know you are thinking the next convention is not until next spring. I don’t want to wait that long. Well you don’t have to, the power points and notes are available online (consultant materials → training→ Convention Presentations). Or you can purchase a DVD of all of the classes. The Home Party Convention DVD ID number is 71113 and the party price is $3.70. If you didn’t attend convention it is $3.70 well spent. Director to Executive: For me the key to this advancement was focusing on Q Customers. When I was a director I finally started to understand how important Q customers are. They are, to quote Sariah, “like gold.” As a Director I think it is a good time to reevaluate your party presentation and make sure you are emphasizing the Q. I really like the white board presentation. If you are not using it maybe you should learn it and give it a try. Executive to Silver Executive: For me the key to this rank advancement was training my team. I have been serious about offering training for my team since my first consultant signed up. I have found that if you want to hit the higher ranks you need to offer consistent training to your team. I did not start training my team as an executive but I did start really reaping the benefits of it. 2. What do you do differently as a Silver Executive that I did not do as a consultant or a mentor? 9. I know where I want to go with this business and I know how I’m going to get there.